Mithapur is located on the extreme tip of the lower jaw of Gujarat. This town is essentially a colony that is supported by Tata Chemicals Ltd., one of the flagship companies of the Tata Group.The Jamnagar District is popular for its wide variety of tourist attractions like lakes, beaches, hill tops and forests. Its range of temples has also been recorded in the Guinness Book of World Records. It is also home to 250 varieties of birds as well as several marine sanctuaries. The town of Mithapur has a twin town named Surajkaradi, which is mainly a trade town. Mithapur Tourism - Get all information on Mithapur tourist places and sightseeing tours. Our website helps you plan your next tour and gives you great ideas on what to do, where to eat, where to stay and when to go there. We give the best information from the web to give you precise, meaningful and useful travel guide for leading places to visit in India and from across the world. Our travel information on MITHAPUR tourist places, tourist attractions, major sightseeing, the best time to visit, the top places to visit in Mithapur, the must-see things to see and do, maps, restaurants, hotels, nearby tourist destinations, local public information and more. 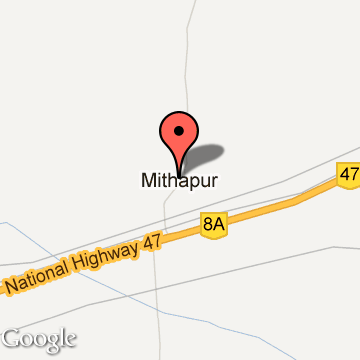 To start with check out information on how to reach Mithapur.